First longbow deer and first trad buck.Ohio 10 pt killed with black widow plv 45@26 with gold tip trad blem 500 and vpa 175. That is awesome! Thanks for posting! Congrats again on your beautiful buck! 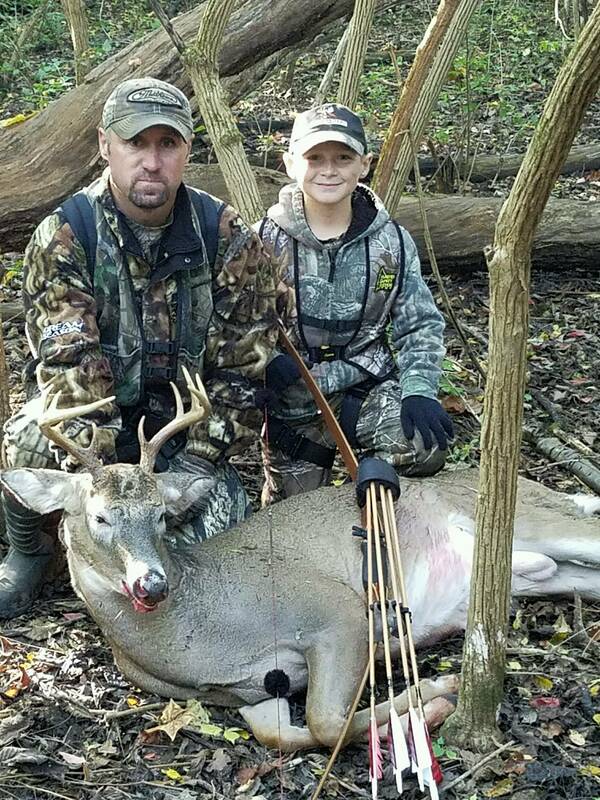 congrats, that is a great deer and picture, there's nothing like having a good sidekick to hunt with, now loan him the longbow and let him get him a deer! There's nothing I would rather see than for him to kill a deer with trad equipment but ohio has a 40# weight restriction so he's stuck to hunting with other things for now but loves being out there so for now that's what matters to me. His time will come hopefully in the next year or two and then the real fun will begin! Good job, hopefully your youngster will pick it up too! Man that is awesome! I love seeing guys with their young hunting buddies. I have been hunting with my son this year, but neither of us has been successful so far. Thanks for sharing. Awesome. There's something quite special about the first read kill buck!